The 16th Glass Performance Conference, June 26 to 28, 2019 in Finland, has registered a record number of some 230 abstracts of experts’ presentations and workshops. The 20 workshops are part of the total program and the high-rise module continues its recent success with expectations of about 160 attendants. This special seminar is held in Espoo Otaniemi, nearby Helsinki in the unique Alvar Aalto’s designed university building. The other Conference programs are based in Tampere. The high-rise seminar is arranged in conjunction with the Aalto University and coordinated by professor, architect Kimmo Lintula and Peter Smithson, BG&E Facades Pty Limited. The high-rise seminar has attracted a very prominent group of speakers from different parts of the world. “From a Nordic viewpoint, a central issue is how to create outstanding architecture for the Nordic environment based on globally available design and technology,” added Mr. Lintula. The program includes Tim Leslie of Bates Smart Architects presenting an architect’s Design Review with cases from Australia and the cold climate new Australian Embassy in Washington. Andreas Hiersemenzel of HAS Façade Consultants presents a facade consultant’s technical review of High-Rise Facades today with case studies including cold-climate Mongolia. Michael Barlow of Urbis Planners deals with the subject of sustainable cities, a presentation well in line with the GPD Master Theme Smart construction. The magnitude of the Elbphilharmonie Concert Hall glass applications can be exemplified with some impressive facts. The building envelope consists of some 1,100 glass elements that reflect the sky and mirror the environment. The reflection effect of the glass façade is over 50 percent while the penetration is a mere four per cent. The total surface area of glass for the Elbphilharmonie is 22,000 square metres. A curved, 80 metre long escalator leads into the building and opens a city view through a glass panorama. 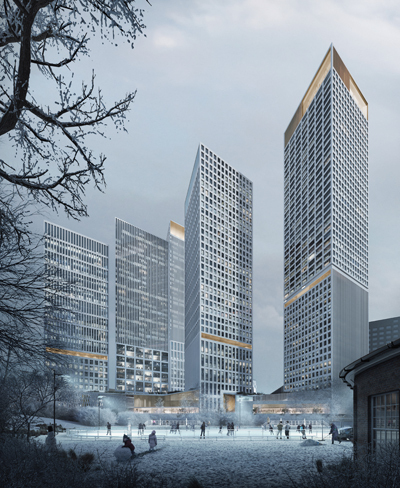 A new facility, The Plaza, located at 37 metres height, combines the parts of the building. High-rise seminar speaker Professor Stephen Selkowitz of Laurence Berkeley National Laboratory in the USA will present scientific views on Smart Glazing and its latest test results in laboratory and practice.